Black and gold, with three large incisions. That is the opening statement that characterises the new building for the Basque Country School of Music, Musikene, the work of architectural studio GAZ in a project headed by architects Aitor Gurtubay, Asier Atxurra and Unai Zelaieta. The building, which has recently been recognised with an award from the Basque-Navarre Architects Association, will provide the missing link in connecting the various key sites that currently form the backbone of Basque musical education. The main problems the architects needed to overcome with regard to this project were the very specific requirements of the school itself and the constraints of the narrow site combined with a high demand for space. These challenges resulted in the top floors of the building extending out past the first by five metres, while the first was adapted to fit the available space. Another specific requirement was to provide for the necessary compartmentalisation of the rehearsal rooms. In order to tackle this and to optimise the lighting in all the spaces, the architectural studio created interior shafts to ensure all the small, individual rooms would benefit from natural light courtesy of the perforated gold panels. 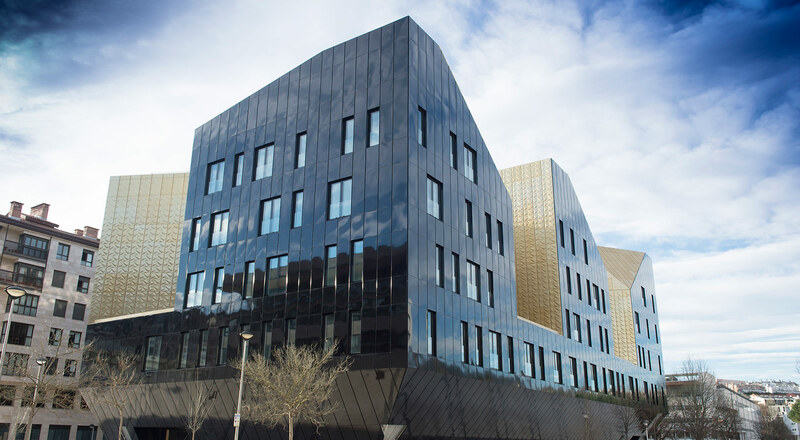 The choice of colours for the building evokes those of the instruments to which it will be home – from the black lacquered exterior to the golden glass featured on the interior facades. In addition to the imposing exterior, the interior revolves around the main concert hall, the point from which the whole building extends outwards.